WOW! Women On Writing Blog: Julia Asel Thomas, author of Loving the Missing Link, launches her blog tour! Julia Asel Thomas, author of Loving the Missing Link, launches her blog tour! 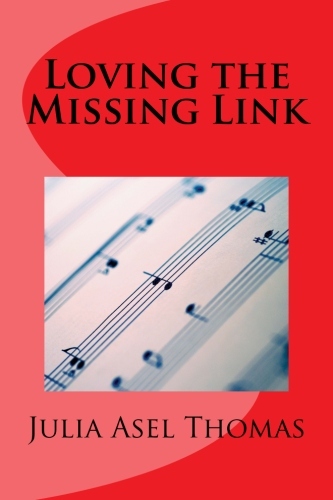 Loving the Missing Link is a fabulous tale about love, success, hope and music. During the 1970s, Young Cheryl Simpson feels trapped in her small Missouri town. As her mother tries to help her find a way up and out, Cheryl begins to feel that it is all an impossible dream. She sees herself living a boring and dismal life for the rest of her days. Just at the moment when she is about to give up on happiness, she gets the opportunity to join her high school band. The band promises a connection with the world outside her town, but Cheryl does not see any future for herself in music. It is just a tool to get where she wants to go. However, Cheryl’s mother arranges for Cheryl to take private lessons with an accomplished musician, who helps her realize the beauty and awesome power of music. Loving the Missing Link is available as a print and e-book at Amazon, Barnes & Noble, and IndieBound. To win a copy of Loving the Missing Link, please enter using the Rafflecopter form at the bottom of this post. The giveaway contest closes this Friday, September 13th at 12:00 AM EST. We will announce the winner the same day in the Rafflecopter widget. Good luck! Like the protagonist in her debut novel, Loving the Missing Link, Julia Asel Thomas knows small town life. However, Julia’s experiences were quite different than Cheryl’s. Julia is the middle child of seven children and the daughter of a church organist and a business manager. Growing up in the small town of Hamilton, Missouri, Julia’s family enjoyed a reputation as a bright and interesting family. Julia thrived on the quiet and carefree life she lived in that gentle place. WOW: Julia, I loved the little book store Sid’s Shelves in Loving the Missing Link, is that mirrored after a particular shop and did you really work at a quaint little book store? Julia: No, the store was just a conglomeration of images and experiences I’ve had in similar bookstores around the Kansas City area. A book store called “Rainy Day Books” comes to mind when I think of a relaxed place to buy high-quality books, but Sid’s Shelves is it own unique entity. As I was writing, I came to enjoy the parts that took place in that fictional store. It just felt like home. I have never worked in a bookstore, but I did work in a library for a short time years ago. I loved handling the books and choosing the ones I wanted to read as they came through the back room, which is an element I included in the story. WOW: I can picture you really enjoying a bookstore like that; glad you made it part of the story. At the beginning of Loving the Missing Link, your depiction of bassoon lessons and the instrument itself is very detailed. Are you a bassoon player and can you tell us more about the importance of music in your writing career and life? Julia: I did play bassoon when I was in school. Unfortunately, I didn’t own the instrument. My parents had planned to buy me a bassoon if I had chosen to major in music, but I decided on English instead. I did take lessons from an accomplished bassoon player, but unlike in the story, he didn’t have to convince me to love the bassoon—I already did. Music has always been a passion of mine. Of course, nearly everyone on the planet enjoys some kind of music at one time or another. For me, music has been a constant companion. However, I am not able to play music as I once did. I have developed a strong tremor in my hands—enough so that I can’t play the piano anymore. I sold mine to my son Damon last summer. In fact, Damon was my inspiration for having Cheryl learn the guitar. He often comes over to my house, carrying his guitar, and when he does, I know I am in for a treat. I don’t plan on writing another story that is so heavily dependent on music, but who knows? It is an important part of my life. WOW: Music seems to as important in your life as in your story, I have a feeling there will be more musical stories in your future. That was one of the things I really enjoyed about Loving the Missing Link! I struggled with the insecurities of young Cheryl; she seemed to lack self-confidence and direction; is that how you felt as a young girl? What can you credit for pushing you forward as the independent woman you are today? Julia: I started out being very independent. I only began to have trouble around 1985, when I was a 20-something student at Wichita State University. I had suffered a major crisis of confidence and was feeling very lost and insecure. The professors and other students were wonderful and tried to encourage me. I felt they expected too much of me, and I felt inadequate to live up to expectations. Not coincidentally, this was the time when I wrote the first two chapters of Loving the Missing Link. When I went back to it to make it into a novel, I tried to recapture those feelings in order to maintain some semblance of consistency throughout the book. After leaving WSU, I floundered for a long time, not feeling strong enough or good enough to do anything productive. Then, one day, my daughter offered to set me up with her copywriting client so I would have something to occupy my time. In less than a month, I had transitioned from doing nothing to writing 12 to 14 hours a day, 7 days a week. The pay was abysmally low, but over the years it has increased tremendously. What is important is that the copywriting helped me develop a strong discipline for writing. It also made me realize that I could indeed do something worthwhile that could be valued by others. My life has never been the same. My independence, then, was a direct result of hard work and the increased self-confidence I gained while copywriting. WOW: I’m glad you found the encouragement you need—no one wants to feel lost and insecure. It’s nice to have friends in your corner when it comes to self-publishing. Was there one person in particular who was really the driving force behind your publishing Loving the Missing Link? Julia: I felt a strong sense of urgency to get this book in print. After all, I wrote the first two chapters in 1985, and my greatest dream for all these years since was to complete the novel and publish it. Now that it is done, I feel more patient. I am considering other avenues for publishing my current novel, a work in progress. WOW: You certainly are patient. I'm glad you didn't wait any longer and that you kept pushing for your dream of publishing. More and more people are opting for self-publishing, so you are not alone in your decision. What is your favorite book? What is it about that book that you love so much? Julia: My favorite book changes yearly. Right now, my favorite book is Thomas Mann’s The Magic Mountain. It is actually a translation from the original German text, but the translation is so spot-on that it is a joy to read. Plus, Mann is such a master of description and characterization that it energizes me in my own writing. WOW: Being energized and feeling supportive can make all the difference when taking on any challenge. Speaking of which, has your community been supportive with your writing goals? Julia: I was invited to join the Kansas City Writers Group a few years ago. The problem was that I am not much of a driver and didn’t have any way to get there. Now that my husband is retired, he has offered to drive me any time I want to go. He is so sweet that way. So, I intend to get involved with them as soon as possible. WOW: Sounds like your husband really is your number one fan; that’s so sweet! Julia: That is an interesting question, Crystal. In fact, one day in the last month, I looked at a friend of mine and said, “You know what? I’m a writer. I’m really a writer!” He smiled and said, “Of course you’re a writer. You’ve been making your living writing for years now.” I told him, “Yeah, I know I write. What I just realized is that it is what I am.” I suddenly shifted from the attitude that writing was something I did to the realization that a writer was who I was. It was a life-changing moment. WOW: I’ve heard that same sort of story from artist and musician friends as well. Giving ourselves those titles seems to really change our outlook. You’re definitely an author now Julia; congratulations! Cheryl’s relationship with her mother was interesting, is that any indication of how you and your mother interact? What role has your mother played in publishing your first book? Julia: Actually, my relationship with my mother is so far from the one Cheryl has with her mother that they cannot even be compared adequately. My mother has always been a gentle presence in my life. I call her every Monday, and we sometimes talk for hours. Even when I was a teenager, I counted on my mom to help me put things into perspective. Cheryl’s relationship with her mom was really based on the relationship of a close family friend and her son. The mother saw the son as an extremely talented person, perhaps even a genius. The son is definitely bright, but he rebelled against his mother’s demands. He is living a peaceful life now, working in a restaurant and hoping to buy a boat so he can live on the water. He is a good friend. It is a shame that he didn’t accomplish more in the eyes of his mother, but he is very happy. And isn’t that the greatest accomplishment of all? WOW: The happiness factor is definitely important and sometimes living up to our own expectations is more important than living up to the expectations of others. I glad your friend is happy and I hope is mother is happy as well in her own way. Any sneak peeks for us about what is in your future? Is there a sequel to Loving the Missing Link? Another project? Julia: I am so excited about my next project! I just resolved a structural problem that had me stumped for over a month. Now, the writing is flowing smoothly. The story is about these 5 people who are admitted into a psychiatric hospital. It is about how they interact with each other and how they respond to the help that is offered. Perhaps a more positive spin on “Cuckoo’s Nest.” I think it is an ambitious project; I hope to have the new book ready for edits in a few months. WOW: I can’t imagine keeping it all straight and I can’t wait to read about the story—adding 5 different perspectives definitely is ambitious! Anything you’d like to add that readers should know about you or Loving the Missing Link? Julia: The main thing I hope readers will get from the story is a new perspective on what success is, and to understand the difference between hope and fantasy a little bit better. And I hope to inspire people to live the best lives they are capable of living. Get in on the giveaway for Loving the Missing Link and hear from Julia Asel Thomas with her guest post "Life Long Learning and Self-Education"
Giveaway and guest post by Julia Asel Thomas today! She shares her debut work with Loving The Missing Link and speaks candidly offering insight in her guest post “Establishing a Writing Routine”. Don't miss your chance to win a copy of Loving the Missing Link and hear what Stephanie has to say after reading this first published work by Julia Asel Thomas. Don't miss today's author interview with Julia Asel Thomas and find out more about her debut book Loving the Missing Link! Julia Asel Thomas writes about "Therapeutic Journaling" in her blog stop at Create Write Now - also happening at this stop is a giveaway of Julia's first published works Loving the Missing Link. Don't miss this stop! Today is your day to hear what Julia Asel Thomas has to say in her guest post about "Journal Writing to Enhance Your Fiction" and an added bonus - get in on the giveaway of Julia's new book Loving the Missing Link (#LMLThomas)! The Spotlight at the Book Bag is none other than Julia Asel Thomas and her New Adult Novel, Loving the Missing Link (#LMLThomas); check out this great blog stop and get in on the givewaway! Giveaway and guest blog stop for Julia Asel Thomas, author of Loving the Missing Link - Julia visits the lemons to lemonade blog and shares her wish for music education titled: "Channeling the Spirit of Professor Harold Hill". Don't miss this stop and giveaway opportunity! Join author, Julia Asel Thomas as she discusses "The Pros and Cons of Teen Marriage" and offers a giveaway and some insight into Loving the Missing Link. Find out more about Julia and her first published book! Hear from Jodi Webb as she reviews Loving the Missing Link by Julia Asel Thomas - don't miss this great giveaway and insight! Join Julia Asel Thomas, Author of Loving the Missing Link as she blogs about "Choosing Your Words Carefully: a guide to finding the best verbs for your purpose" and don't miss this giveaway of her newly published work! Julia Asel Thomas, Author of Loving the Missing Link offers a giveaway opportunity and shares her insight on “Finding Realistic Hope” this is something we can all benefit from; don’t miss this tour stop! Book Giveaway Contest: Enter to win a copy of Loving the Missing Link Just fill out the Rafflecopter form below. We will announce the winner in the Rafflecopter widget THIS Friday, September 13th. Great interview, ladies! I love new adult novels and look forward to reading Loving the Missing Link! Julia: I'm so glad you stuck with it and finished the book you started in 1985! That's persistence. I have a few projects that are eight- or nine-years-old and I feel like I'm too out of touch with the topic and my writing voice has changed since then. How were you able to pick up where you left off? Nice interview. I always like being able to get a bit more insight regarding a book. As to how I recaptured the voice: I'm not sure, except that 1985 was so traumatic for me that the memories are still very strong. I also read over the first two chapters several times to get the cadence of the words and refresh my memory about Cheryl's history and attitudes. That original story has always been important to me and I always knew I would return to it. The manuscript for that part of the book was lost for a few years. It was still so fresh in my mind that I was able to type it out again, I think practically word for word, from memory. Thanks for your interest in my story and for your kind comments! I love what you said at the very end of your interview--very inspirational! :) I probably know some of the same people as you--I am from Missouri and used to be president of the Missouri Writers' Guild (do you know about MWG--you should check them out if you don't) and know people in the Kansas City Writers Group! :) I love stories set in Missouri--I was born and raised in St. Louis. Congrats to you and I wish you much success!